It starts with an idea - your idea. A rough sketch. A few specs. 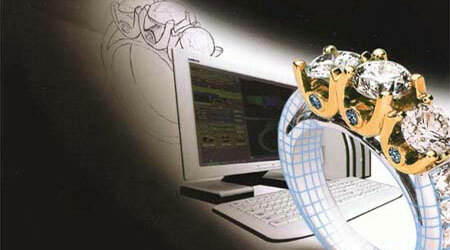 Our designers produce a detailed CAD drawing that is true to the concept while ensuring functionality. J. Thomas converts the drawing into a three-dimensional resin model more precise than human hands can fabricate. Turn your old unwanted jewelry into your own new custom designs. J. Thomas Jewelers - your personal jewelry designer. We transform concepts into fine jewelry. We use state of the art technology as a tool - not an end itself, but a way to bring 21st century speed and precision to the process of designing. We also have our own in-house jewelry designer to help you create a one of a kind piece. If you are looking for that breathtaking ring, necklace, bracelet or pair of earrings, our friendly and knowledgeable staff are always here to help.